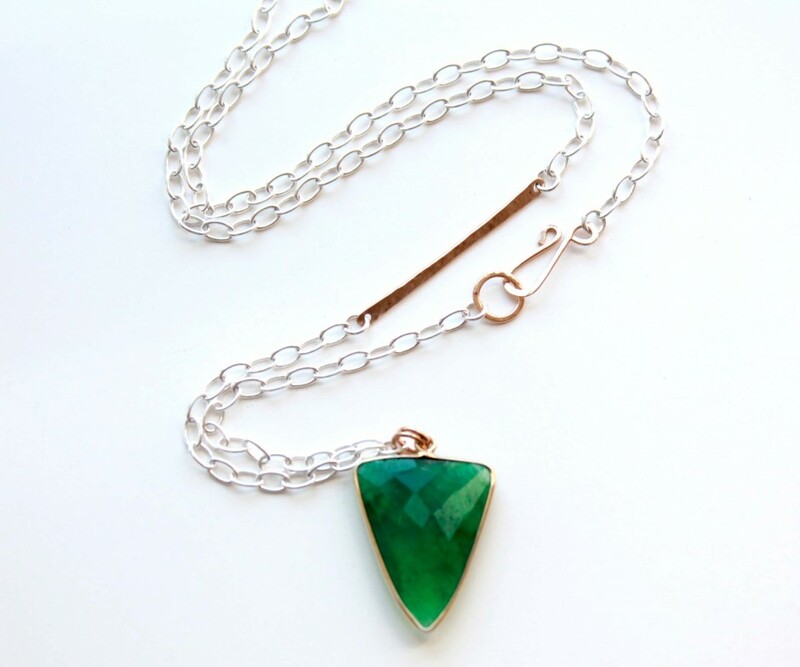 Mixed metal gemstone necklace with Emerald triangle pendant. Gold and silver artisan handmade necklace. May birthstone jewelry. Asymmetrical necklace. 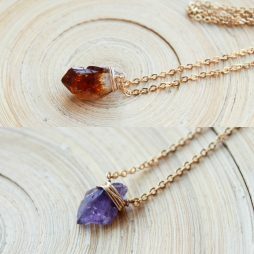 Necklace is made from gold filled and sterling silver. 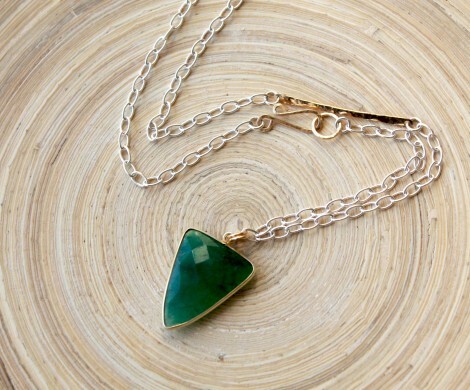 Big emerald gemstone pendant, 18 mm x 25 mm with gold over sterling silver settings. 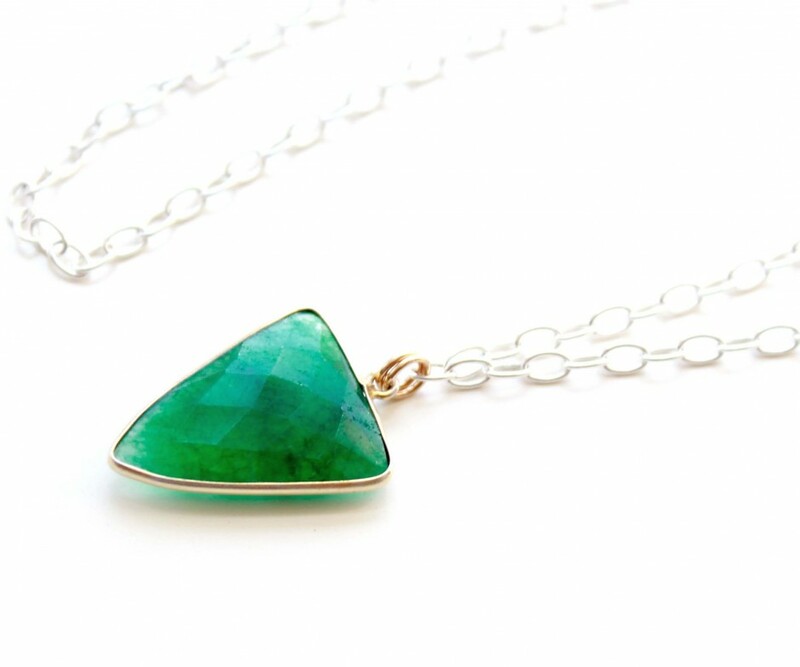 Faceted green emerald gemstone. 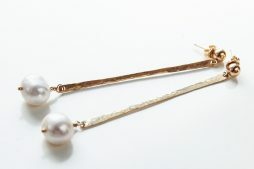 Gold filled handmade hook clasp. Materials: silver filled, gold filled, gold vermeil. Category: Necklaces. 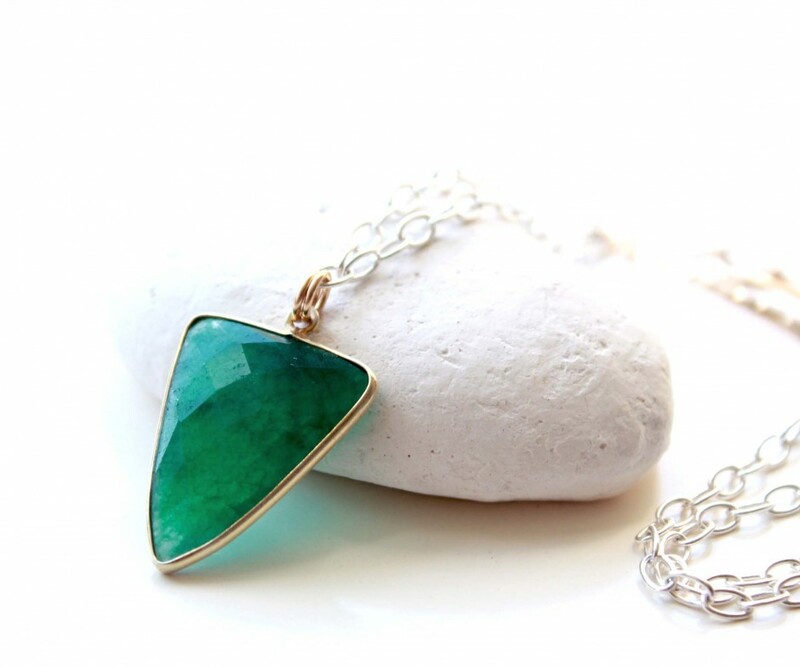 Tags: 20 inch long, anniversary necklace, artisan necklace, asymmetrical necklace, Birthday gift, buy gift, emerald gemstone, emerald necklace, geometrical necklace, gold and silver, gold filled, green gemstone, hand -forged parts, handmade necklace, jewelry artist, jewelry designer, jewelry online, made by hand, May birthstone, mixed metal, online jewelry store, silver filled, spike pendant, Toronto Cnada, triangle pendant, unique gifts. © Emerald pendant and mixed metals asymmetrical necklace. Geometrical shape pendant in gold settings. 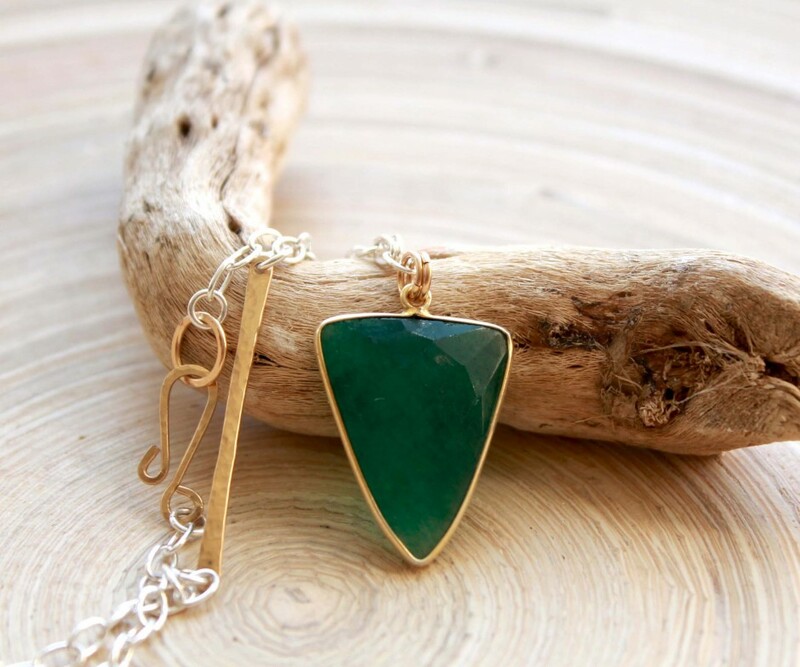 The pendant is genuine emerald gemstone, faceted , 18 mm x 25 mm big, spike (triangle) shape, and is attached to a silver filled chain. The chain is 3 mm x 2 mm links and is silver filled.The settings of the stone are gold over silver. Hand -forged hook clasp is placed on the side of the necklace, hammered from gold filled wire.On the other side of the necklace is attached gold filled hammered bar link. The necklace is 20″ long in total. The green of the emerald is the colour of life and of the springtime. Gold filled Y- necklace with Herkimer Diamond, modern jewelry, gift for her. Raw shape Herkimer diamond nugget crystal 10 mm- 12 mm big, AAA quality. 14k gold filled chain. 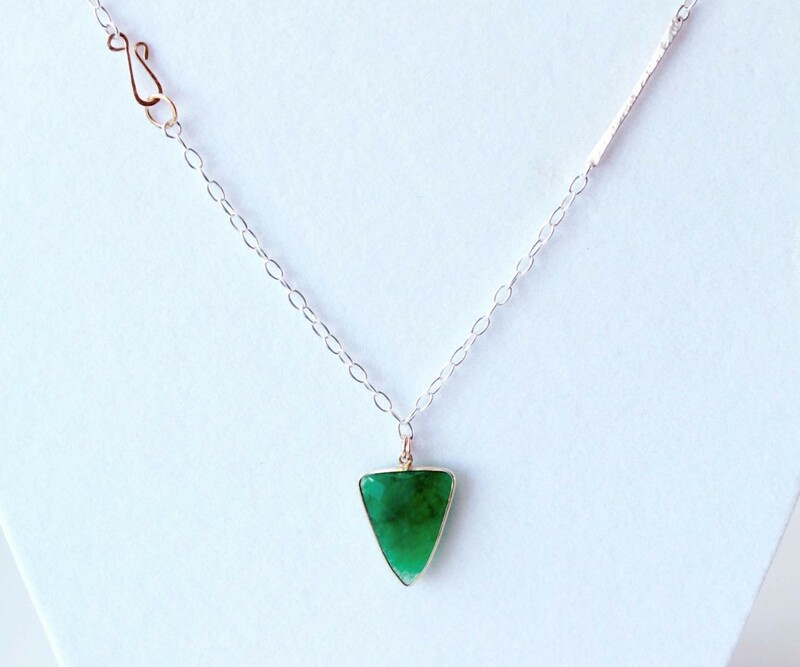 The necklace is 16″ around the neck and the drop is 3.5″ long. Spring clasp closure. 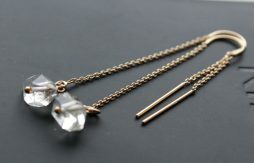 Materials: natural Herkimer diamond crystal, 14k gold filled chain and findings, spring clasp closure.